All of the llamas used in our pack string come exclusively from Great Northern Llama Company (GNLC). 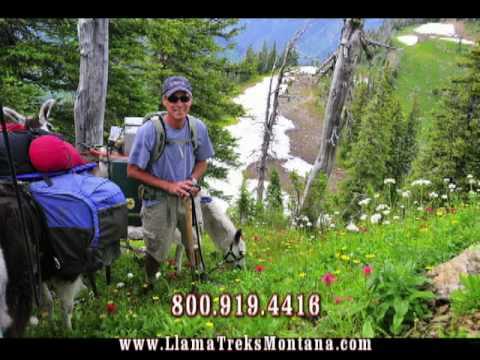 Steve Rolfing is the founder of Great Northern Ranch, and was the owner of Montana’s first llama outfitter-guide service before selling his operation to Swan Mountain Llama Trekking. Llama breeders know that if it’s tall, beautiful, statuesque & strong . . . there’s a good chance its name starts with GNLC. If you know anything about llamas, you’ll see the Rolfing’s GNLC herd identifier in just about every show-winners list. Steve originally bought llamas in 1979 to carry his timber cruising equipment in the forests of northwest Montana. 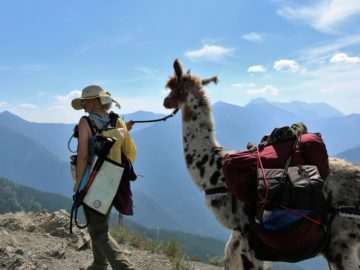 True to their Andean heritage, his llamas were such great trail companions and surefooted mountaineers that in 1981 Steve began guiding commercially outfitted llama pack trips in Glacier National Park and the Flathead National Forest. He also established one of North America’s most successful breeding programs for llamas and their wooly cousin, the alpaca. GNLC is committed to producing big, beautiful, and statuesque llamas in all fleece types, and Swan Mountain Llama Trekking is honored to feature only GNLC llamas in its string. To us, the ideal llama is one that can stand in the fanciest halter show one weekend, and carry our gear to camp the next weekend.